Whether they’re large-scale farmers, hobby gardeners or outdoor enthusiasts they’ll appreciate this small Almanac wall calendar. The Almanac provides weather information, sunrise and sunset times, best planting guides and best fishing days. Also included on the grid are Julian dates, moonrise times and Zodiac information. Features a mini calendar of the previous and following month for quick reference. 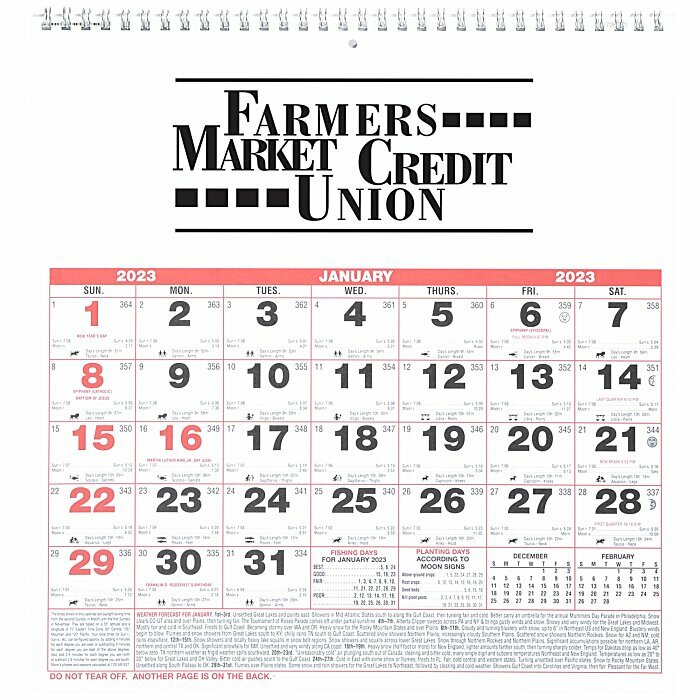 This 12-month calendar is printed on six sheets with the first six months on the front and the last six months on the back. Made of 70# paper stock with a silver double spiral binding. For a larger Almanac calendar, please see item #123723-1711Almanac Wall Calendar - 17" x 11". Your price includes a black imprint on top of each month of the calendar.